ITV’s ‘colourful new brand identity’ didn’t extend to its London HQ reception area, which has been refurbished as part of the launch. In a take on Henry Ford’s famous diktat, it seems they were offered ‘any colour as long as it’s white’ for the fixtures, fittings and general decor, reserving the rest of the spectrum for the logo. Concord’s Beacon luminaires add some dazzle to the razzle, and give would-be celebrities visiting the studios within an excuse to don shades even on the gloomiest day. Now here’s something special: forget minimalism, neutral tones and technology, W Sitch can restore or reproduce any metal light fitting you want from its modest but crowded Soho workshop. The family business has been going since 1776 and with customers like English Heritage, Merchant Ivory films, 10 Downing Street and Edinburgh Castle, this Aladdin’s Cave of lighting treasures must have something for any heritage project. And if it doesn’t, take a reccy anyway – just for pure wonder. If you’re looking at those elegant street lamps and thinking, actually, they’re just what I wanted for the living room, then designer Marc Aurel will rest happy. His approach to lighting the public areas of Poitiers old town in France was to imagine the spaces as a kind of urban living room, with lights that look familiar to relax passers-by. 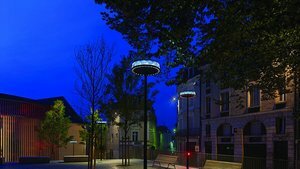 iGuzzini’s Anello discs on sticks fitted the bill, but let’s hope that the illusion isn’t too good, leading late night revellers to snuggle down on the benches under the impression that the walk home was shorter than they imagined. There should be nothing out of date in the new head office of a company with a name like Imagination Technologies, an up-to-the-minute sounding business if ever there was one. So Trilux’s high LED content lighting seems to fit the bill, contributing to the building’s eco-credentials as well as the firm’s desire for a sleek contemporary look for the staff to feel at home in. The real mystery is, with all those trendy square yellow chairs mirroring the new square lights above, why is everyone standing up? When a wine seller names itself Hedonism and calls its retail outlet a boutique you know it’s pitching for a particular type of customer – especially when it’s in London’s swanky Mayfair. But with ambience as critical as temperature control when you’re selling fine wines in such style, the lighting had to be spot-on. Rosco’s 8mm thick LitePads offered a mix of cool and warm white LEDs that prevent the place getting overheated – either literally or metaphorically speaking. When it comes to adding interest Spectral is your flexible friend. Not only does its Turus luminaire send out an attractive light from its LED bulbs, but the piece itself is stylish too. The bendable, low powered LED system creates a continuous homogeneous light source that can be scaled up or down and moulded into any shape by individual designers. As Christmas approaches, a giant halo might be just what your festive interior needs. Bologna is one of the wealthiest cities in Italy, cited as offering the best quality of life too, so a revamp of one of its many squares to encourage the public to linger in a historical ‘garden’ context seems fitting. Viabizzuno contributed a lighting makeover to reveal its treasures at night, notably illuminating the plinth-bound, 19th century economist and statesman Marco Minghetti. Whether the city’s most famous political son would have approved of the expense of dolling up the square cannot be known, but it’s certainly improved his view. Never knowingly undersparkled might be the new John Lewis department store motto – at least in its jewellery, fashion advice and lingerie departments, now that it has installed these huge crystal lights from Kolarz. To make sure it holds its own in not only the usual quality and price stakes, but for ambience too, the retailer sought a bit more glamour for the girls to browse in. With visibility levels now making views of the merchandise crystal clear, it won’t be outshone. Let’s hope it’s an investment that pays off.